The threat of a recession is in the news again and it is enough to make even the most confident employee feel insecure. Your resumé is your personal marketing tool and having a well-written one could earn you a better chance in securing an interview. 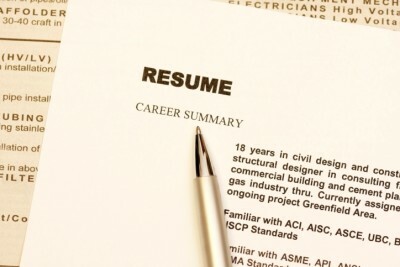 Update your resumé regularly even though you are currently employed. This serves as a contingency should you lose your job. You can begin sending out your resumé without any delay. As time goes by, you may forget your achievements in previous jobs. It is good to create a folder to record every specific achievement, no matter how small it may seem. An e-folder would be ideal as you can cut and paste your achievements onto your resumé easily. A prospective employer will look at how a potential employee can add value to his organisation and he is going to be impressed with a detailed record of your previous achievements. Knowing your strengths is vital if you are to present the best possible picture of yourself on application forms, in your CV and at interviews. Think about your current and previous jobs. What strengths have you shown in them? Have you been patient, reliable, determined, self-disciplined, calm under pressure, personable with even the most demanding clients or colleagues? Make a list. The self-knowledge that you gain will help you to be clearer about what you offer to employers. Education is the best investment. Keep up with what is happening in your industry and profession. Continue to sharpen your skills and learn new ones. If you need to attend a course to be more competent in your job, do it. Personal development should be self-driven and self-funded. A good habit to cultivate is to set aside an annual budget for self-development courses. As you gain more knowledge and skills over time, your chances of keeping your job are higher, though not guaranteed. You can also transfer your knowledge and skills to a more challenging position. If you are serious about finding the best position for your next career move in a timely manner, you must network. The goal is to move into the hidden, unadvertised job market, using every available resource that contact with other people will provide you. No doubt it takes time to network. But the effort could prove invaluable as your network could be your next source of job leads. Remember: It’s not who you know; it’s who knows you. The ability to listen, write, and speak effectively is critical in business. You need to polish your communication skills to enhance your working relationships with colleagues and business associates. This is a critical task when anticipating bad times. If you are still employed and qualify for bank credit facilities, a personal loan could be of good use to meet some of your daily needs if you become unemployed. If you have insurance policies that offer bonuses, the accumulated cash value could be partially withdrawn as a policy loan to meet some of your daily needs as well. Ask a financial consultant for advice on your options. Be likeable, friendly and cooperative. These are vital traits that you should develop to the fullest. Competent people with such traits tend to be hired first and fired last. Explore other career options even though you are currently employed. This is your Plan B, which will kick in when your present job does not advance you further. You can draft your contingency plan yourself or with the help of a career coach. He will be able to help you decide where you want to go or what you want to be at some defined point in the future. Career planning and financial planning are not a one-off exercise. They are part of a practical, essential and on-going process that you should undertake to secure your future.